in Essaouira and the Province. A challenge for the advanced mountainbiker is to climb Djebel Hadid. It is a partly difficult to severe expedition depending on the season. Djebel Hadid is situated about 30 km north of Essaouira. Visit the Landmark "Qalb" at an altitude of 100 m about 2 km uphills, moderate climb. Duneforest. Paths. Near Diabat. and rain and floods in the winter. Studies reported in the IMBA (International Mountain Bike Association) Trail Solutions manual found that a mountain bike's impact on a given length of trail surface is comparable to that of a hiker and substantially less than that of an equestrian. The International Mountain Bicycling Association (IMBA) is a non-profit educational association whose mission is to create, enhance and preserve trail opportunities for mountain bikers worldwide. Essaouira town has today improved streets and asphalt roads suitable for cycling. 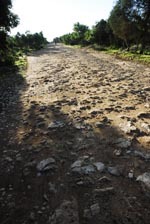 Main roads to the regions are also paved. But the regional two-lane roads don´t give much space for cyclists. An exception is the newly built Expressway to Ounara (25 km) - Chichaoua (118 km) for bicycle training. Leaving the main roads means you find sandy and rocky tracks. Road signs are very rare as marked trails for visiting sights. Theese trails are more suited for mountainbikes or walking.